Congratulations for taking our Flying Food Feast Reader’s Quiz! And now … (drum roll) … Here are the answers! 1. Why does Julia wear a raincoat to the restaurant? 2. What does Julia decide when she is worried about getting messy? 3. Why does Eumundi call the restaurant? 4. What does the waiter say to Eumundi when they arrive? 5. Who did not get to whack a prawn? 6. How did City react to the raw egg splatting on him? 7. Which friends had egg on their face? 8. How did Hammy get to eat his rice? 9. Has Eumundi been to this restaurant before? 10. What does the chef write on the grill? 11. What are some ways you can decide not to worry about the future, but just enjoy what you are doing right now? – It’s often true that when we worry about the future, we make it seem a lot worse than it actually turns out to be (like Julia worrying about getting messy at the restaurant). – When we decide to enjoy everything that we are doing, and get the most out of every day, a lot of the things we may have wasted time worrying about never actually happen! So just enjoy today! 12. Sometimes we need to find new solutions for a problem. When Hammy had trouble using the chopsticks, what were some ways he managed to eat? – Hammy tried to use his chopsticks but it was very tricky for him. When one of his chopsticks went flying, he tried shovelling the rice with the other chopstick, but found that very unsatisfying, so he ended up eating the rice with his paws! – When he was having trouble eating the prawn, Eumundi helped out and lowered it into Hammy’s mouth for him! Teamwork and helping your friends out is always a good way to overcome challenges! 13. Do you have a problem you need to find a new solution for? – Sometimes we can get a bit stuck when we have a problem that we can’t seem to fix. Sometimes the best way through is to write down as many different ideas, and out of some of the craziest ideas, we just might find our solution!! Have fun! 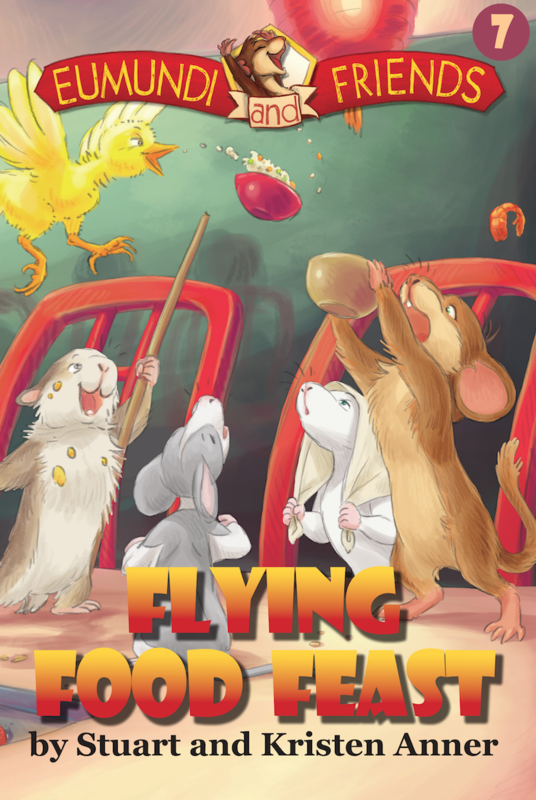 Did you leave a review for Flying Food Feast yet? Please click here to leave your comments – we would LOVE to hear how you enjoyed the story, and it will help others find these wonderful books! Thanks for taking our Flying Food Feast Quiz!! We hope you had fun and learned something new!